You may take my title literally—since I've recently enjoyed the dumping of ash from Mt. Redoubt's volcano upon my head—but metaphorically speaking, I feel rather like a phoenix emerging golden and reborn from seeming death. Perhaps I embellish with the phoenix reference. and soar among the clouds . . .
Alright, alright. I'm just a raggedy-tag mother lumbering toward her computer at o'dark thirty, steaming mug of coffee in her hand and a thrill in her heart, happy at the thought of returning to one of her very favorite pasttimes after six weeks of self-imposed exile from the Internet. 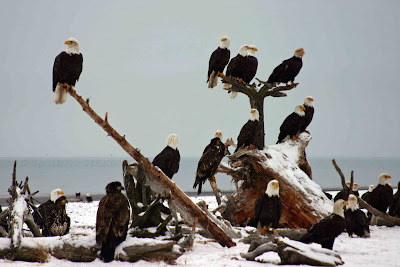 Since we don't have a single phoenix in Alaska (I hear it's too cold up here for them to nest properly), these pictures of eagles will have to do. I feel refreshed and renewed and ready to fly. Hello, cyberworld! Kim is back and ready to blog. Wow, I just happened to get on the computer to delete some old posts, and lo and behold - Kim made her first post-Lent post 3 minutes prior! I feel so lucky! I hope you had a beautiful and enriching Lent and Easter. YAY! Missed you, and I'm glad you're back1 Happy Easter Monday! Yeah!!!!! Kim's back in the house!!! The blogging world has missed you! I am so glad you are back!!! I have been in a major blogging slump (thus no posts) and have taken a little break myself. So glad that this time of fast as renewed you. Looking forward to reading more of your great posts! Nice to have you back, and I hope you enjoyed your "self-imposed exile"! 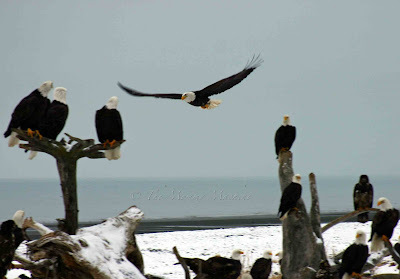 I love the pictures of the eagles. Did you take those pictures? Thanks, guys! It's good to be back. Yes, Lana--I did take those pictures of the eagles down at the beach over Spring Break. The new photo on your page banner is spectacular, by the way. Yippee! So glad you are back. 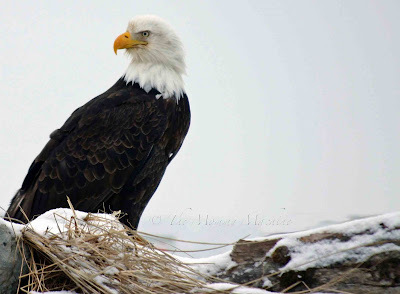 Awesome eagle pics, btw. I've missed The Mommy Machine!